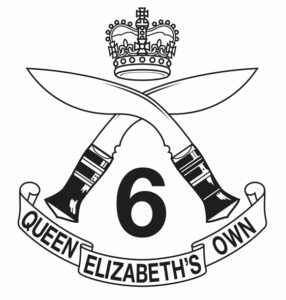 The 6th Queen Elizabeth’s Own Gurkha Rifles was a regiment of the British Indian Army, before being transferred to the British Army following India’s independence. Originally raised in 1817 as part of the army of the British East India Company, the regiment has been known by a number of names throughout its history. Initially the unit did not recruit from the Gurkhas, although after being transferred to the British Indian Army following the Indian Mutiny in 1857, it became a purely Gurkha regiment, in due course with its regimental headquarters at Abbottabad in the North West Frontier Province of British India. After 1947 the regiment was one of only four Gurkha regiments to be transferred to the British Army and this continued up until 1994, when it was amalgamated with other Gurkha regiments to form the Royal Gurkha Rifles. Over the course of its 177 year history, the regiment was awarded 25 battle honours, although prior to World War One it had only been awarded one and no battle honours were awarded to it after World War Two. Please visit the 6th Gurkha Rifles Regimental Association website. Provided and maintained by the 6th Gurkha Rifles Regimental Association, it aims to help perpetuate the memory of the Regiment for all those who had the privilege and pleasure to serve in it. It is also a means of communicating the activities of “The Association” and “The Trust” as well as informing visitors of the activities of the 6th Gurkhas, both past and present.